Living on the Eastern Shore of Virginia means having an abundance of seafood wherever you go. Crabs, shrimps, oysters, clams… you name you can get it all year round. Don’t get me wrong, I love seafood (with the exception of most fish) as much as anyone else on the Shore, but sometimes you want something different. 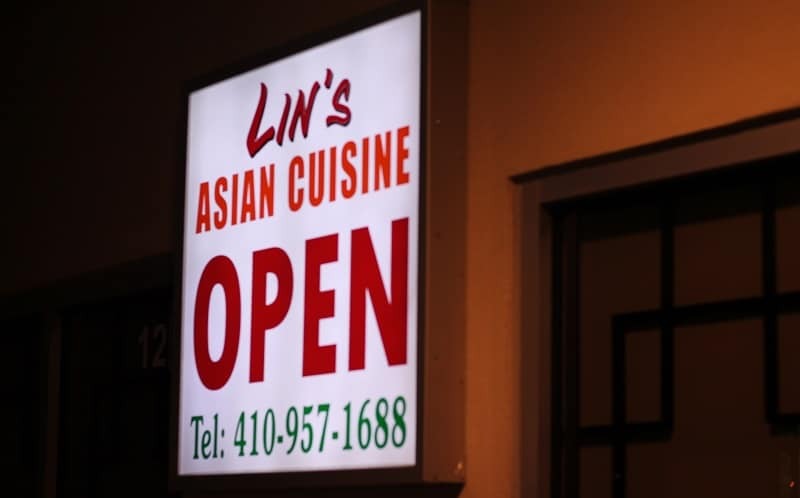 Tonight that something different was Lin’s Asian Cuisine in Pocomoke, Maryland. A short 15 minute drive to Maryland is always worth it to John when it comes to Sushi. Up until last year the only Sushi available on the Eastern Shore was the fake stuff; at least within an hour of us. I’m not huge on Japanese food, but John is. I love Chinese food. Let me rephrase that. I love American Chinese food (the stuff most restaurants make to cater to us.) Lin’s Asian Cuisine isn’t so much American Chinese food as traditional Asian food. Yes, they have stuff like General Tso’s Chicken & Shrimp (which is what my son ordered) but it’s made with less American intent than other Asian restaurants. It’s because of this authenticity that I enjoy visiting Lin’s Asian Cuisine. 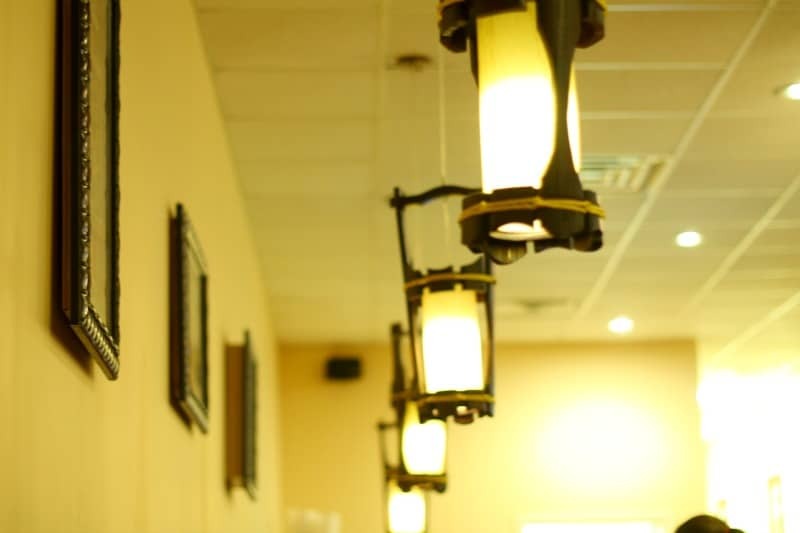 I don’t love everything on the menu, but I love the variety and ambiance of the restaurant.I’m not a sushi girl. I hate the taste and texture of seaweed wraps; almost to the point of gagging. Up until Lin’s came to the Eastern Shore I had only tried sushi 1 time in my life. It was a “spicy tuna roll” and it made me swear to never try it again. John managed to convince me to try a Dragon Roll on our first visit to Lin’s. I actually liked it. I continue to try new Sushi each time we go to Lin’s Asian Cuisine. I don’t expect to like it all, but I do try it. I’ve surprised myself a few times by actually eating more than 1 piece of the same sushi. Like the Dragon Roll, my how I love that! Tonight’s sushi consisted of a Spider Roll, Pink Lady and Goddess Roll. I only tried one tonight as I was busy with my own meal. I tried the Pink Lady since John ordered it with me in mind. Instead of a seaweed wrap the Pink Lady was wrapped with a pink crepe wrap. It was a mix of tuna, salmon, yellowtail, avocado and cucumber. The cucumber seemed to overwhelm the rest of the ingredients, but it wasn’t bad. It was definitely a nice change from the seaweed wrapped sushi. I opted for Japanese cuisine instead of my usual Chinese food. I ordered the Scallop & Steak Hibachi which came with Miso Soup and a basic salad with ginger dressing. I passed the Miso Soup along to John and ordered Egg Drop soup for myself. Lin’s Asian Cuisine makes the best Egg Drop Soup I’ve ever tried, hands down. My son chose General Tso’s Shrimp for his dinner. I love the detail they put into his dish; a “flower” made of orange slices and broccoli with a “butterfly” hovering above. I’m still not sure what they used to make the butterfly but it looked fantastic. I of course stole some of the shrimp and broccoli. The sauce used was a bit too spicy for him so I was happy to help him not waste. As I said before, this is one of Lin’s Asian Cuisine American Chinese dishes,catering to locals and what they think Asian food should taste like. While it was good, it wasn’t authentic. It was a nice change going to Lin’s on a Monday. We normally go on a weekend and they are packed. Like, people lining up at the door packed. As I said, this is the only place to get good/real Sushi within a comfortable driving distance. If they served nothing else, they would stay open for the Sushi alone.